Whoever said that blue wooden watch are not cool is in for a great shock. These slick looking unisex watch is one of the best design watch from the Bobo Bird list of watches. 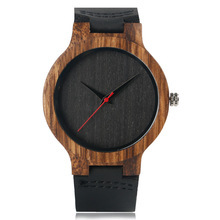 This blue leather wooden dial watch is a summer accessory that you should grab while not every one has it yet. The wooden accessory era is about to come. Don’t wait for it to become a mainstream. Present it and brag about it while only a few owns one. It is a great substitute to the classy watches that you cannot really wear for casual hang-outs and adventure seeking trips. It is gorgeous, classy and the most flexible among all the watch design. It is easy to pair with. Be it shorts or pants, casual or formal look, this watch is a good addition to your fashion. Quality wood and leather band.